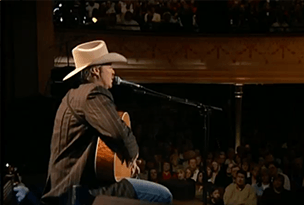 Filmed Live from the Historic Ryman Auditorium in Nashville, Tennessee! and Exclusive Family Interviews on this keepsake DVD! Relive this Personal & Historical Event with this Unique Collection! 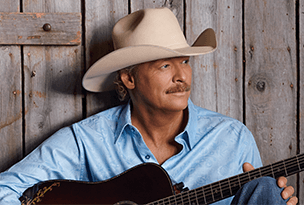 Over the past 25 years, Alan Jackson has become part of America's musical landscape as a major country music icon. Now, experience his live performance, showcasing his heartfelt renditions of some of the most popular hymns. 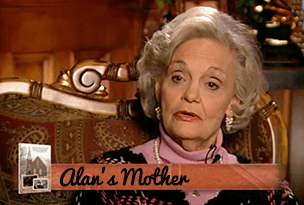 This unique DVD captures intimate interviews with Alan, his wife, and his mother as they reflect on his musical roots as well as his personal journey. 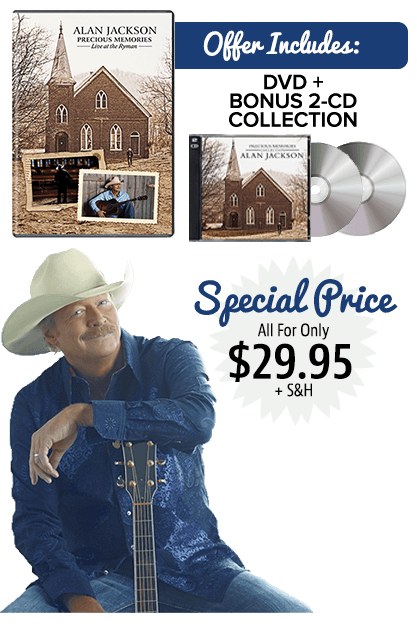 The Alan Jackson Precious Memories Collection features a DVD taped live at the historic Ryman Auditorium, in Nashville, Tennessee and the 2 CD Precious Memories Collection. His powerful performance features songs from his very personal release Precious Memories. Showcasing his heartfelt renditions of some of the most popular hymns of the church including “How Great Thou Art,” “In The Garden,” “The Old Rugged Cross” and more, the release also features exclusive interviews with Alan, his mother and wife as they reflect on his musical roots.